Editor's note: This post may be old but it is still as true as ever. Today is the day to let your geek flag fly high! Today is the day you stand up and wish random people to "Live Long and Prosper" and proclaim that Greedo Shot First. Today is the day you let haters and the confused know that you are proud of who you are. Today is the day when arguments end and no one questions your dedication to your passion. 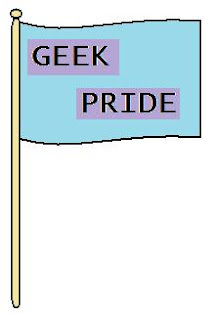 Today is the day when n00bs and L33t stand together and Whedonites and Twihards join hands to say together that no matter what, YOU ARE PROUD TO BE A GEEK! Today is also the day certain fan groups celebrate a specific holiday, at least according to Wikipedia. To Hitchhiker fans, have a Happy Towel Day. To the Jedi, Sith, Stormtroopers and Rebels, have a Merry Star Wars Day. Finally, I wish the best to Discworld fans on the Glorious 25 May. have an amazing Geek Pride Day ! !